I am a Tamilian from Kerala. I come from Palghat, on the border of Tamil Nadu and Kerala. I am from the Iyer community. I love acting. I have always wanted to act -- the medium could have been anything. So I started modelling. After college, when I was doing my MA from Mumbai University, I was offered an audition for a Malayalam film. I did, and got the role. It was called Chakram, and starred Mohanlal. It was a huge thrill for me. He is one of my favourite actors. Unfortunately, the film was shelved. There were some issues between the director and Mohanlal. After this, I did an ad for Dada (Pradeep Sarkar). A couple of months later, he asked me to audition for a music video. I ended up doing three music videos with him -- with Euphoria, Shubha Mudgal and Pankaj Udhas. 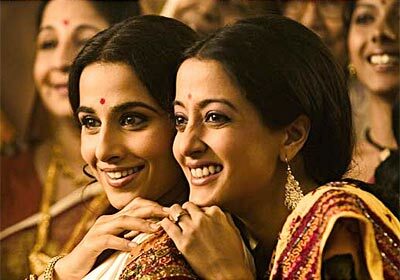 Mr Vidhu Vinod Chopra wanted to have a bankable star in Parineeta. But Dada had visualised me in the role. So I was taken through a whole regimen of preparation and testing for a couple of months -- photo shoots, performance tests, how to get the look right, costume trials and lots more.